Out-the-box simple, easy, and successful methods allow you to quickly build a program, or effortlessly reinvent yourself! Our research-proven programming gives parents the tools and stategies to experience success quickly. Includes multiple additional documents and support resources. 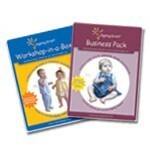 All you need to run a successful Signing Smart workshop for parents of hearing newborns through 2 year olds. More than just motivating parents to sign, this workshop with ready-made slides helps parents develop a comprehensive plan for getting started with Signing Smart. In addition, through interactive activities and video demonstrations we teach parents techniques to take advantage of the Four Keys to Signing Smart Success: how to create contexts in which children most easily learn signs, how to bring signs into children's world (so they never have to look at parents to see the signs! ), how to recognize children?s first signs, and how to sign in all kinds of contexts without needing to sign all day or even every time parents say the word! Parents will be eager to use the tools and strategies you provide because they enable families to feel successful from the very first day! Contains all you need to begin teaching 2-hour workshops right away, including detailed notes, adult group activities, video examples, handouts, and PowerPoint slides/overheads. As an additional bonus, we have included notes and PowerPoint slides to expand the presentation into either a 3-hour single-session workshop or into a mini-series format! As a special offer, we include the Signing Smart Business Pack, which contains all you need to successfully start or expand your Signing Smart program. Instructors also receive a sample set of the complete line of Signing Smart printed materials for families. Also includes a CD of relevant documents and handouts as well as a DVD Clip Bank of families "at home" using and demonstrating Signing Smart strategies, and child versions of many target signs. In addition, all Signing Smart Instructors benefit from a wealth of other business and program support. Click here to find out more about the support and resources available for Signing Smart Instructors Please Contact Us for information on becoming a Signing Smart Instructor and to purchase the Workshop-in-a-Box for a Parent Audience.